Also, want to find my half and enjoy each other. It can be anything, from washing the dishes, up to discovering new horizons together. Want to be a part of my plan. ;) I wake up every day at 5 a.m. and then make breakfast for my small family. Hundreds of beautiful Russian girls look for their future husbands abroad with the help of free dating sites. In Uadreams they all are educated, intelligent and have serious intentions. You are welcome to meet them free in the Gallery of ladies! Why is it advantageous to meet free Russian brides on UaDreams? Have you tried to meet your future wife in your native city, but soon understood that women in your country are too independent and emancipated? Look for free a wife in Russia! Russian girls beware all the traditions their mothers instill in them. Family takes the first place for any Russian woman. Thay pay a lot of attention to their men, always try to cook tasty dishes for them and to keep the house clean and tidy. They support their men in their carriere. It is always easier for men to achieve any goal having such a caring woman by his side. UaDreams can help you to date free a Russian girl online who will match you the best! Join the UaDreams Russian dating site free and start your search! It is very easy. Just enter your name and e-mail adress, think out a password and add a profile picture for free. It takes just a minute. If you have no time to add some words about you, you can do it later. However don't forget to describe yourself and determine what kind of free Russian bride you are looking for. In such a way you will make your search and dating Russian girl free much more efficient. Your personality will be much more interesting for women if they will be able to learn something about you. It is so easy to meet and date Russian ladies free! Go to our Gallery of Ladies and you will be suprised how much you can learn about each lady from her profile. Use advanced search in the Gallery of ladies. Whom do you want to meet? A woman with blue or brown eyes? Should she want to have children or not? Perhaps you would like to meet a young mother who has already got her own child? All these options and more you can choose with the help of Anvanced search in the Gallery of ladies on our free personal Russian dating site. You are welcome to watch brides' videos for free and make sure that they are real and lovely. Meet Russian girls online free! You will find a lot of ladies' photos there that will show you the girl in various images. Each bride told a lot about her in her profile, so you will be able to read what she likes and how she imagines her future life. Single women write how they start their day, describe their hobbies, pets and are always ready to answer your questions. 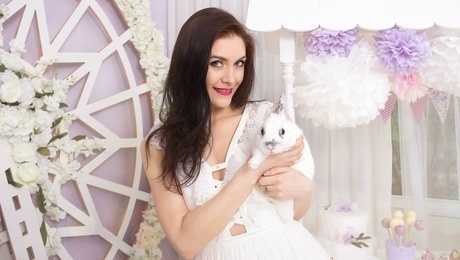 If you want to meet russian brides who joined UaDreams recently, choose the option New ladies. And if you want to try your luck, click on Photo gallery and enjoy a plenty of photos of many girls in one place. So, choose a Russian girl you like the most and start your Russian date for free! It is very simple, just go to the lady's profile in Ladies Gallery and click the button Write a letter. You will be automatically redirected to a page with blank field where you can write your first «hello» to your new friend. Ask the lady about her attitude to marriage and how she imagines her future family. Ask her about her family and tell her about yourself. Send some of your photos to the lady. Show her your hobbies and what you like the most. It is very important for your future relationship to learn as much as possible about each of you both. Write your first Russian brides free message now! Read more on our blog where to meet Russian women. We all like holidays, don't we? UaDreams celebrates a lot of holidays as well and invites its members to celebrate together. How? A lot of various special offers let the agency's members use free minutes of video dating chat, write letters, send and receive photos and videos for free. So you can send your wishes to your lady and talk more! And this is not everything! Sometimes we add some gifts for your lady to our offers you will not have to pay for. Really, you will save a lot of money. And the most exciting offers and discounts refer to dating trips to Russia. Each month dozens of our members come to Ukraine to meet free their beloved russian girls in person. This is the most important step in each relationship. Only after your personal meeting you will understand, if the lady is your real second half and matches you perfectly. The majority of our customers are satisfied with our services. You are welcome to read free Russian dating site reviews. We wish you a pleasant dating with UaDreams! If you might have any questions, please, contact our friendly support center. Do you wonder how we do photo shooting for our ladies? Now you have a great opportunity to watch the backstage process!